“The children are often the neglected sufferers in disasters like this. With no power and no full schooling, that means a lot of down time while parents are busy cleaning debris and getting around having a damaged infrastructure,” said David Johnson. This Christmas, more than 300 children affected by the devastating impact of hurricanes will receive some holiday cheer thanks to two cooperative partnerships between Cane Bay Cares and both Project Promise VI and the St. George Village Botanical Garden, announced Cane Bay Partners VI, LLLP Co-Founders David Johnson and Kirk Chewning. Since being established in September, Cane Bay Cares has distributed more than 25,000 pounds of food and other aid, 20,000 bottles of water, 4,000 freezer packs for medical use, 800 inflatable solar lights, 44 generators and other relief to St. Croix. For Thanksgiving, CBCs distributed holiday-themed food to the community and delivered turkeys to organizations cooking meals. But that was for the adults – shouldering the enormous burden of rebuilding and surviving in the wake of two catastrophic hurricanes. The children have been without a fully functional educational system and getting by with no power, and Cane Bay Cares wanted to make sure they had at least one present to open this Christmas. 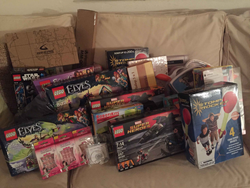 So Cane Bay Cares partnered with Amy Parker De Sorbo from the St. George Village Botanical Garden, who wanted to help fill the void from the Toys for Tots program not being on island this year. She set a goal of being able to bring toys to 500 kids ages birth to 16. Cane Bay Cares created an Amazon Wishlist with age appropriate toys and asked our network to help purchase toys. Fifty-seven donors stepped up and purchased a toy through this drive – and when the shipping deadline approached, Cane Bay Cares purchased an additional 229 toys for this drive. 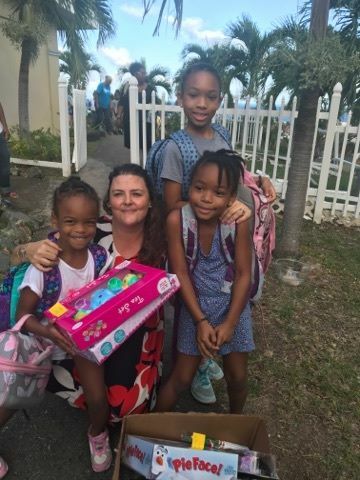 Amy has already been able to deliver hundreds of toys to children in Frederiksted, Christiansted, local schools and organizations like the Women’s Coalition. Toys included items like the OWI T4 Transforming Solar Robot, xylophones, fairy princess dress up, super hero dress up, Lego sets and more. CBCs also partnered with Naita Salmon of Project Promise VI to help get children participating in their Caterpillar Project and their siblings gifts for the holiday. The Caterpillar Project seeks to improve the lives of at-risk young people on St. Croix through empowerment initiatives, cultural programs and family services. Many of the children were severely impacted by the storms and the toy drive was meant to help bring them a sense of normalcy during trying times. Donors generously purchased 14 gifts through the wishlist and Cane Bay Cares purchased an additional 17 gifts after the shipping deadline. Gifts purchased included sneakers, super hero dolls, coloring books, jewelry making kits and clothes. “Project Promise’s Caterpillar Project is extremely grateful to Cane Bay Cares for organizing this toy drive for our caterpillars and their siblings. If it was not for this effort, some of our children would not have received gifts this year,” said Salmon. “We’re in this recovery effort for the long-haul and that means adjusting our strategy as needs on the ground evolve. We know the need is great and will continue to be there and committed to doing everything we can to help the island and its residents,” said Kirk Chewning, co-founder of Cane Bay Partners. “So we need continued support and sustained donations to keep this alive and going. About Cane Bay Cares: A service initiative of St. Croix-based Cane Bay Partners VI, LLLP. Cane Bay Cares was established after three strong hurricanes, including two Category 5 storms, Irma and Marie, caused much damage to St. Croix during September 2017. The initiative has a goal of providing relief to the citizens of St. Croix. To make this possible, we have partnered with Community Foundation of the Virgin Islands, which is a 501c3 nonprofit that was established in 1990. All donations to Cane Bay Cares are donations to CFVI and are 100% tax deductible. Cane Bay Partners coordinated the donation of more than 300 toys through the St. George Village Botanical Garden and Project Promise VI to bring holiday joy to children impacted by two devastating hurCane Bay Partners coordinated the donation of more than 300 toys through the St. George Village Botanical Garden and Project Promise VI to bring holiday joy to children impacted by two devastating hurricanes on St. Croix.